Instruction is explicit when the teacher clearly, overtly, and thoroughly communicates to students how to do something. The procedures for teaching explicitly are different for the younger child who has little experience with formal instruction and the child who has already had some formal instruction. A good deal of the early information, skills, and strategies that children need to learn can be taught using a simple model, lead, test teaching procedure. A model is simply a demonstration by the teacher. For example: the teacher segments a word slowly (mmmaaannn), then blends by saying it fast (man); the teacher points to the letter s and says its sound (ssss); or the teacher points to the letters in a word and sounds out the word without pausing between sounds (sssuuunnn), then says the word at a normal rate (sun). In a lead step, the teacher helps the student make the desired response. 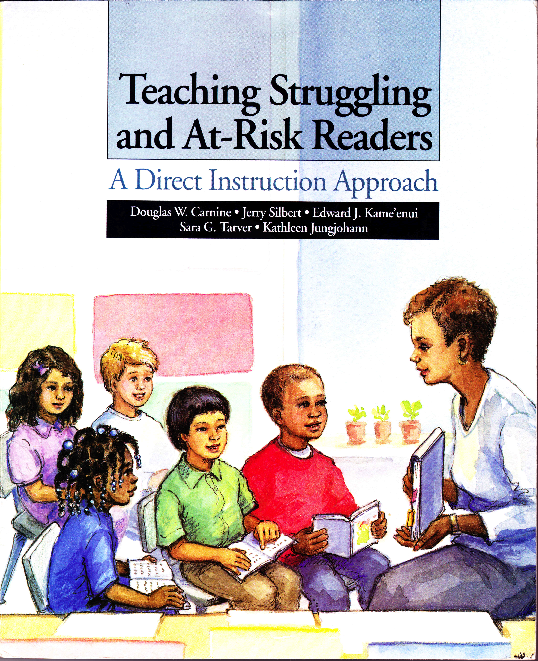 The most common method of leading in teaching beginning reading has the teacher make the response with the students as they try to apply what the teacher has just demonstrated. For example, when students are first learning to sound out a word, the teacher provides a model, then leads, responding with the students (“Say it with me, sssuuunnn”). Young children may need a number of lead trials before they can make the desired response. The teacher continues leading, responding with the students, until they can make the correct response several times in a row. Note that leading is not required on all responses, just those that the child is not able to correctly imitate after a demonstration. During … beginning reading instruction, students are more likely to be attentive if seated close to the teacher. For beginning reading instruction, we recommend seating the students in chairs, without desks or tables, in a semicircle or rows directly in front of the teacher. The teacher sits facing the group, looking out over the classroom so that he or she can monitor the entire class. The students … should be facing toward the teacher and away from the other students so they will not be distracted. Easily distracted students should be seated closest to the teacher make it easier for the teacher to monitor their performance and give encouraging pats or handshakes. It is interesting to note that just the opposite pattern often occurs with less-proficient students seated farthest from the teacher. Teacher monitoring of distractible and instructionally naive students is easier when they are seated in the middle of the group rather than on the sides. …. During the beginning reading and early primary stage, the teacher maximizes students’ active responding by structuring tasks to incorporate unison responses. Unison responding, in which all the students respond at the same time facilitates a high degree of active student involvement. Much of the instruction in the beginning and early primary stage is suitable for unison responding since the tasks are of a nature where there is just one correct answer (e.g., when shown the letter m and asked, “What sound?”, the students answer, “mmm”). The advantage of frequent unison responses is that all students actively practice each skill throughout an instructional period. Unison responses also provide the teacher with frequent information about each student’s performance. Teachers can structure tasks to be highly interactive by keeping explanations short and giving students frequent opportunities to respond. Unison responding can significantly accelerate student progress, particularly for children who are more instructionally naive. If the teacher presented tasks only to individuals instead of the group, some students may answer only a few times during a period. Such infrequent responding often results in inattentiveness on some students’ part, less practice on important reading skills, and restricted information about student performance on the teacher’s part. For the advantages of unison responding to be fully realized, teachers have to utilize a number of techniques. The first technique involves making it clear when students are to respond. Unison responding is most effective when all the children in a group create their own response and none rely on mimicking other children’s responses. Some children are initially less confident than others and will have a tendency to rely on others to come up with the answer. A technique referred to as signaling is used to facilitate active self-initiated responding. 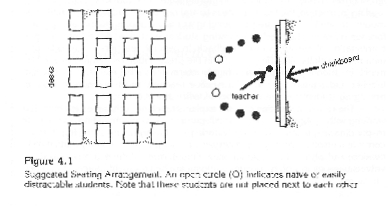 A signal is a cue given by the teacher that tells students when to make a unison response. The effective use of signals allows participation by all students, not just the higher performers who, if allowed, tend to dominate the lower-performing students. For example, if a teacher neglects to use a signal when presenting a complex comprehension question, higher-performing students are likely to respond long before lower performers have had a chance to organize and produce their responses. As a result, the lower-performing students may learn to copy responses from the other students, or they may just give up. Either result leads to a reduction in the amount of practice these lower-performing students receive. A signaling procedure can avoid this problem. After the directions comes the pause for think time. The duration of think time is determined by the length of time the lowest-performing student needs to figure out the answer. (If one student needs significantly longer to answer than the other students in the group, the teacher should not slow the group for this child. The teacher should consider providing extra individual practice for that student or placing the child in a lower-performing group.) For easier questions (simple tasks involving review of previously taught skills), the think time may be just a second, while for more complex questions, the think time may last several seconds. Carefully controlling the duration of think time is a very important factor in maintaining student attentiveness and providing students with a successful learning experience. The final step in the signaling procedure is the actual cue to respond. A cue or signal to respond may be a clap, finger snap, hand drop, tap on the board, or any similar type of action. In some tasks, the teacher would say “Get ready” a second before signaling. The consistent use of “Get ready” a second before the actual signal can help in ensuring a clear signal. The “Get ready” cue is particularly useful when students are looking at a reading passage or during teacher-directed written tasks, since students are looking down and cannot see a hand signal from the teacher.